Since Tadpoles live in freshwater, I had to change my title a bit from “Books to Sea” to “Books That Make a Splash” so it still fits our ocean theme this week, but it’s more scientifically accurate. I love the ocean, lakes, ponds, waterfalls, sea creatures, aquariums, and anything related to those wonderful creations. I like to start my kids off immediately loving them too. Our first born son’s baby room was decorated with the ocean theme, so he feel to sleep each night with a fish net holding stuffed animal crabs, dolphins, sting rays, and more hanging from his ceiling, stick-on fish stickers lining his walls, and sailboats on his crib cushions. 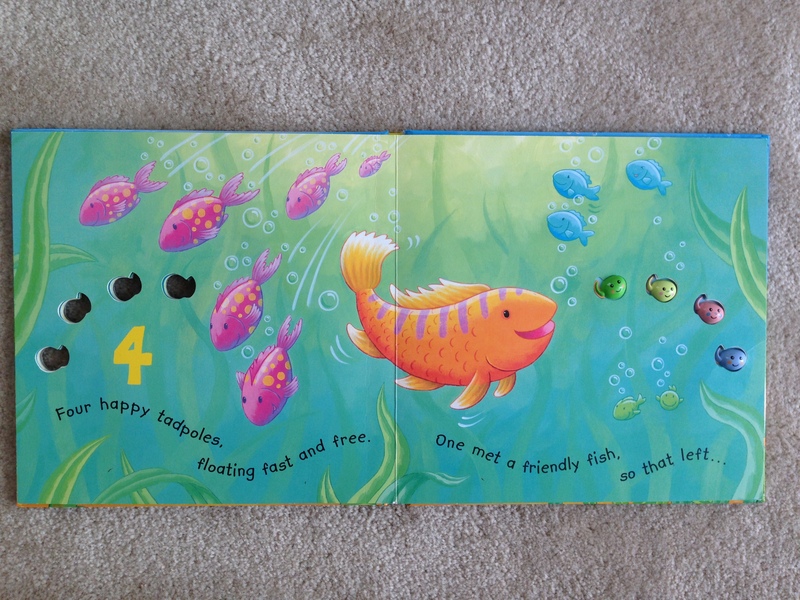 A more simple but still special way to help kids love and learn about the water-life is by reading them books like this one! When looking for books to help our kids count from 1 to 10, this is one of my favorite finds. 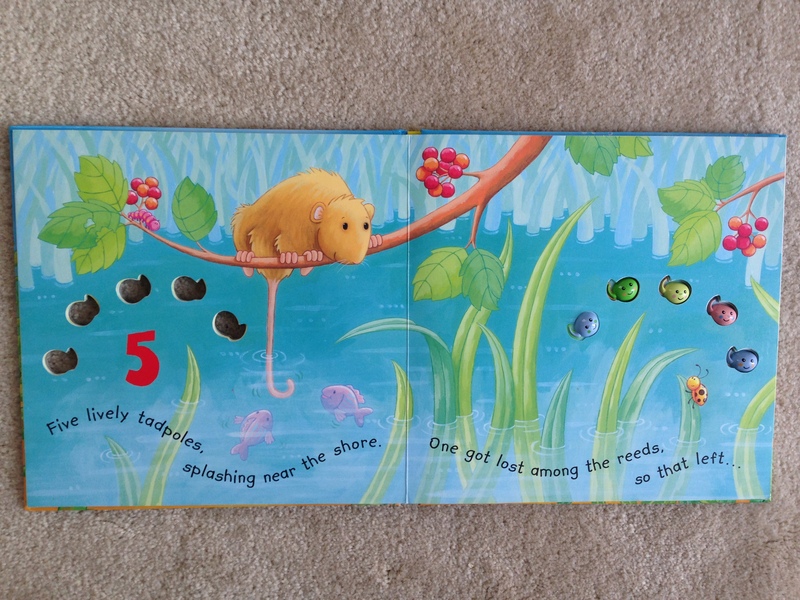 The vibrant colors, free-flowing illustrations, cute couplets, and 3D tadpoles make the count down from ten to one fun! Ten tiny tadpoles, wriggling in a line. One went chasing dragonflies, so that left . . .
Nine speedy tadpoles, too busy to wait. One couldn’t quite keep up, so that left . . .
Each page holds the audience’s interest, especially as the rhyme is completed after turning the page. Enjoy your creative countdown with the wonderful water creatures! F- Feel the raised, 3D tadpoles as you turn each page. On the second reading, have your children count the tadpoles as they touch them. *If your audience is ages 4+, teach them a little bit about braille by telling them that blind friends read by using only their fingers because they can feel raised bumps (like these tadpoles are raised from the pages). You could even get a book of braille from your local library so they can close their eyes and feel it. R- Have your children relate the counting of ten to one to other toys, crafts and games you do with them that teach counting. You can also get a cool spaceship book and/or toy and do a 10-1 countdown to take off. I- Imagine with your audience (5+) that were asked to write two pages to add to the book, by including numbers 12 and 11. Work on the rhymes and writing together. Do the activity listed with letter E below together first to get you started. Make a list of rhyming words for twelve and eleven, then develop ideas of more water-creatures and illustrations to go with the couplets you compose together. N- Navigate your way through the science of tadpoles turning to frogs. 5 HOMEMADE MATH GAMES FOR KIDS! Shhh! Don’t even tell them you’re working on math skills. They’ll never know! 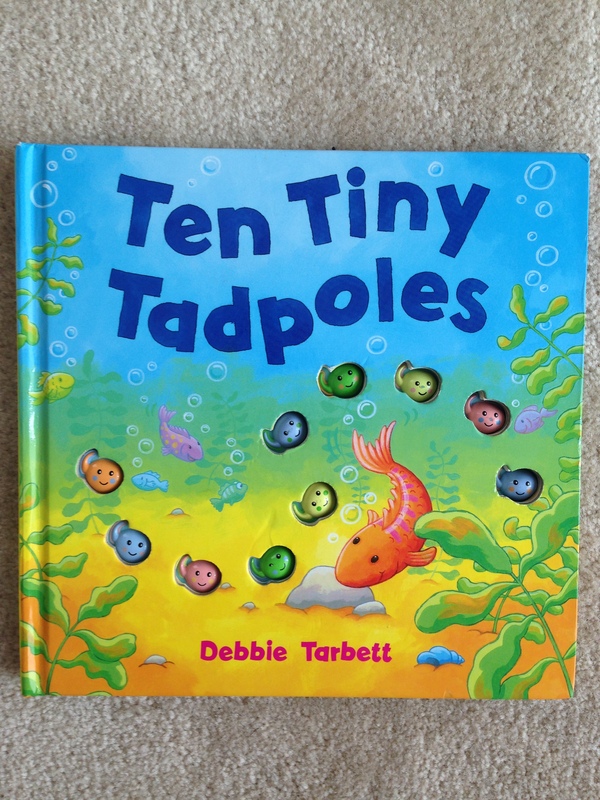 This entry was posted in Ocean, Scholastic and tagged 3D books, children's books for counting to ten, counting books, Debbie Tarbett, handfoot & Footprint Art, ocean books, Rainy Day Mum, Scholastic, Ten Tiny Tadpoles. Bookmark the permalink.